It was so great being back to the Demonica world and getting to see so many familiar faces. Razr is an angel. After being subjected to the binding of his wings and the placement of an Azdai glyph (which basically means he has to be tortured whenever it lights up), followed by banishment to the human realm due to his team losing the most important and powerful gems would really like to return to heaven after years of searching and suffering. Jedda is an gem elf and she needs these gems to survive. Eons ago she and her siblings found extremely powerful gems that led them to split apart and hide from their perusers. Now she’s owner of gemstone shop in UK with her human and paranormal clientele. Razr has finally been given information to find where his stolen gem is which takes on a search to finding Jedda, after which everything goes wrong. A powerful fallen angel isn’t allowing them to leave the sacrificial party if they don’t promise to find and return with 2 very powerful gems one of which happens to be Razr’s. Both of them are hiding secrets and having them in the open could result in death of either or both of them. I really liked Razr, he felt extremely guilty for the events that led to the loss of the gems and the lives lost due to it. His reaction to his punishment and the way he chose to continue on suffering even though *we* knew that he wasn’t really to be blamed for the events was touching. Jedda on the other hand was badass but she also had great love for her siblings. I think she was a very strong woman; just the right mixture of kickass and vulnerable. I think I really liked the fact that at their core they were just very good individuals willing to sacrifice themselves for others. Razr and Jedda are extremely intrigued by each other and feel a very strong connection to each other from the moment they. They also had great chemistry (as with all Larissa Ione couples). I felt like even though the book is a novella we do get a lot of depth character and relationship wise. We get to see go from strangers to team mates to lovers and its just extremely well. 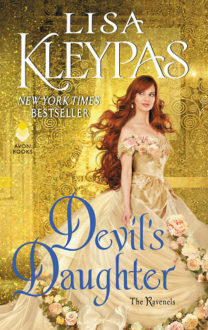 This is yet another wonderful couple in the series of the demonica world (they are all just matched excellently together). 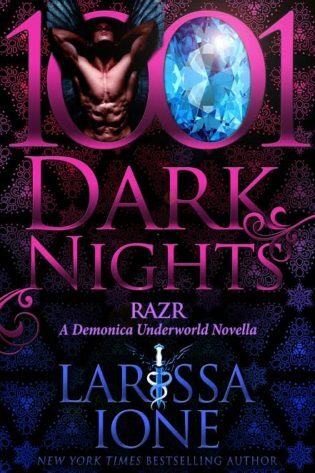 I really enjoyed this addition to the demonica series, it’s fast paced with a great battle/action to romance ratio and as it introduces newer elements and realms I can’t wait to see what Larissa Ione has in store for us next! !